Sample is irradiated by cold neutron beam. Elemental nuclei capture neutrons, emit characteristic prompt gamma rays upon de-excitation. Measurement of gamma rays gives determination of elements in the sample. Prompt gamma-ray activation analysis is a measurement technique for nondestructive elemental analysis. Samples are irradiated by a beam of neutrons inducing elemental nuclei to capture neutrons and emit characteristic prompt gamma rays upon de-excitation. When these gamma rays are measured using a high resolution germanium detector, the energies the gamma rays energies identify the neutron-capturing elements, while the intensities of the peaks at these energies reveal their concentrations. The amount of analyte element is given by the ratio of count rate of the characteristic peak in the sample to the rate in a known mass of the appropriate elemental standard irradiated under the same conditions. PGAA is a widely applicable technique for determining the presence and amount of many elements simultaneously in samples ranging in size from micrograms to many grams. It is a non-destructive method, and the chemical form and shape of the sample are relatively unimportant. Typical measurements take from a few minutes to several hours per sample. Typically, the sample will not acquire significant long-lived radioactivity, and the sample may be removed from the facility and used for other purposes. A thermal instrument, located on neutron beam tube VT5, is used primarily for certification of Standard Reference Materials, primarily biological and agricultural materials with high hydrogen content. A cold neutron instrument, located on guide NGD, is used primarily for certification of inorganic SRMs as well as for user collaborations with an emphasis on measurement of trace hydrogen and boron in materials. This instrument is designed to minimize background, while maximizing neutron flux. Structural and shielding materials for this and neighboring instruments have been chosen to avoid generating a background of capture and decay gamma rays. Hydrogenous absorbers are avoided. Li-6 is used wherever possible for collimators and absorbers, and antimony-free lead is used for gamma shielding. 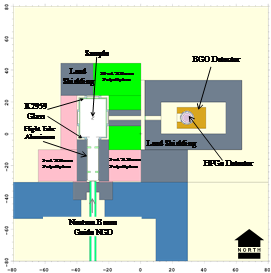 Neutron flux is maximized by using a cold neutron beam, cooled by passage through a liquid hydrogen cold source at 20K, with a focusing neutron guide. As a result, the sensitivity for most elements is a factor of 10 to 20 better than with any thermal beam in existence. The detection limit for hydrogen is less than 1 microgram in most materials. Typical elemental detection limits for cold and thermal PGAA are given below The list is not exhaustive; most elements can be detected and quantified. Cold neutron PGAA has been used for multielemental analyses of a wide variety of materials. One ongoing application is in support of the U.S. hydrogen infrastructure, to provide the U.S. research community with hydrogen concentration standards of the appropriate matrix and at the concentrations needed. NIST provides a user-friendly research facility in which scientists may conduct static and dynamic hydrogen determinations in diverse materials and systems with nondestructive analytical capabilities. R. L. Paul, D. Sahin, J. C. Cook, C. Brocker, R. M. Lindstrom, D. J. O'Kelly, "NGD Cold-Neutron Prompt Gamma-Ray Activation Analysis Spectrometer at NIST," J. Radioanal. Nucl. Chem. 304 (1) (2015), 189-193. E. A. Mackey, R.. L. Paul, R. M. Lindstrom, D. L. Anderson, R. R. Greenberg, "Sources of Uncertainties in Prompt Gamma-Ray Activation Analysis," J. Radioanal. Nucl. Chem. 265 (2) (2005), 273-281. R. L. Paul, "Hydrogen Measurement by Prompt Gamma-ray Activation Analysis: A Review", The Analyst, 122 (3) (1997) 35R – 41R. R. L. Paul, R. M. Lindstrom, and A. E. Heald, "Cold Neutron Prompt Gamma-ray Activation Analysis at NIST – Recent Developments", J. Radioanal. Nucl. Chem., 215 (1) (1997) 63-68. R. L. Paul, H. M. Privett III, R. M. Lindstrom, W. J. Richards, and R. R. Greenberg, "Determination of Hydrogen in Titanium Alloys by Cold Neutron Prompt Gamma Activation Analysis", Metallurgical and Materials Transactions A, 27A (1996) 3682-3687.